Most of the British colonies on the east coast of North America were established in the 17th and early 18th century, when geographical knowledge of North America was incomplete. Many of these colonies were established by royal proclamation or charter that defined their boundaries as stretching "from sea to sea"; others did not have western boundaries established at all. These colonies thus ended up with theoretical extents that overlapped each other, and conflicted with the claims and settlements established by other European powers. By the time of the American Revolution, the boundaries between the various colonies had been for the most part surveyed and agreed upon in the eastern part of the country, where European settlement was densest. (The one notable exception to this trend was the ongoing dispute between New York, New Hampshire, and independent Vermonters over the land that would eventually become Vermont.) The British government's Royal Proclamation of 1763, while not resolving the disputes over the colonies' trans-Appalachian claims, sought to cool them by placing significant restrictions on white settlement in the region. The proclamation was largely ignored on the ground, however, and various frontier settlement enterprises, owing allegiance to conflicting colonial governments, continued. The claims of the colonies corresponded in varying degrees to the actual reality on the ground in the west at the eve of the Revolution. 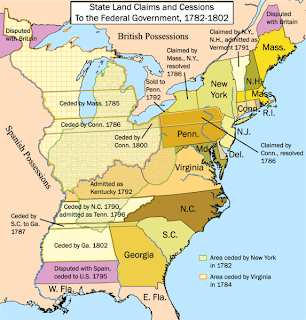 Kentucky, for instance, was organized into a county of Virginia in 1776, with Virginia serving as practical sovereign over the area right up until its admission into the Union as a separate state in 1792. Massachusetts' claims to land in modern-day Michigan and Wisconsin, by contrast, amounted to little more than lines drawn on a map. The Treaty of Paris that ended the American Revolution established American sovereignty over the land between the Appalachians and the Mississippi; the jobs of determining how that land should be governed, and how the conflicting claims to it by several of the states should be resolved, were one of the first major tasks facing the new nation. The potential for trouble arising from these claims were twofold. One problem was obvious: in many cases more than one state laid claim to the same piece of territory, but clearly only one would be ultimately recognized as the owner. The other conflict also threatened the peace of the new union. Only seven of the thirteen states had western land claims, and the other, "landless" states were fearful of being overwhelmed by states that controlled vast stretches of the new frontier. Virginia in particular, which already encompassed 1 in 5 inhabitants of the new nation, laid claim to modern-day Kentucky, Indiana, and Illinois, and the smaller states feared that it would come to completely dominate the union. 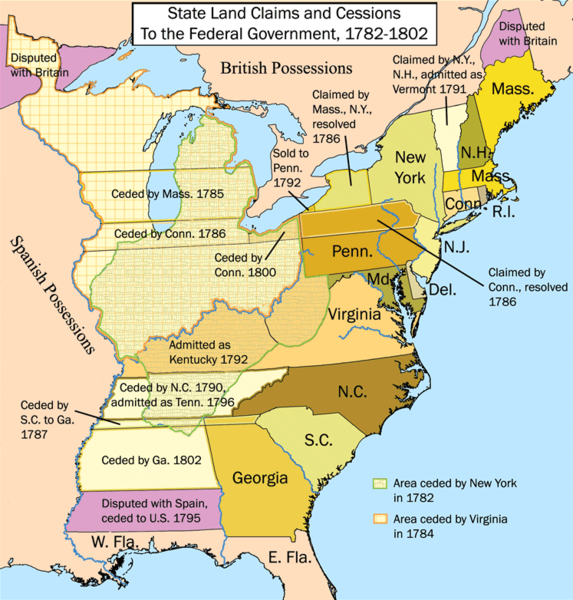 In the end, most of the trans-Appalachian land claims were ceded to the Federal government between 1781 and 1787; New York, New Hampshire, and the hitherto unrecognized Vermont government resolved their squabbles by 1791, and Kentucky was separated from Virginia and made into a new state in 1792. The cessions were not entirely selfless—in some cases the cessions were made in exchange for federal assumption of the states' Revolutionary War debts—but the states' reasonably graceful cessions of their often-conflicting claims prevented early, perhaps catastrophic, rifts among the states of the young Republic, and assuaged the fears of the "landless" states enough to convince them to ratify the new United States Constitution. The cessions also set the stage for the settlement of the Upper Midwest and the expansion of the U.S. into the center of the North American continent, and also established the pattern by which land newly acquired by the United States would be organized into new states rather than attached to old ones. Georgia held on to its claims over trans-Appalachian land for another decade, and this claim was complicated by the fact that much of the land was also disputed between the United States and Spain. When Georgia finally sold the land west of its current boundaries to the United States for cash in 1802, the last phase of western cessions was complete.